This is a concept drawing of the new Fountain Plaza Station. A gleaming new station at Fountain Plaza – complete with radiant heating for cold winter commutes – awaits Metro Rail riders later this summer following a project that begins Saturday morning. 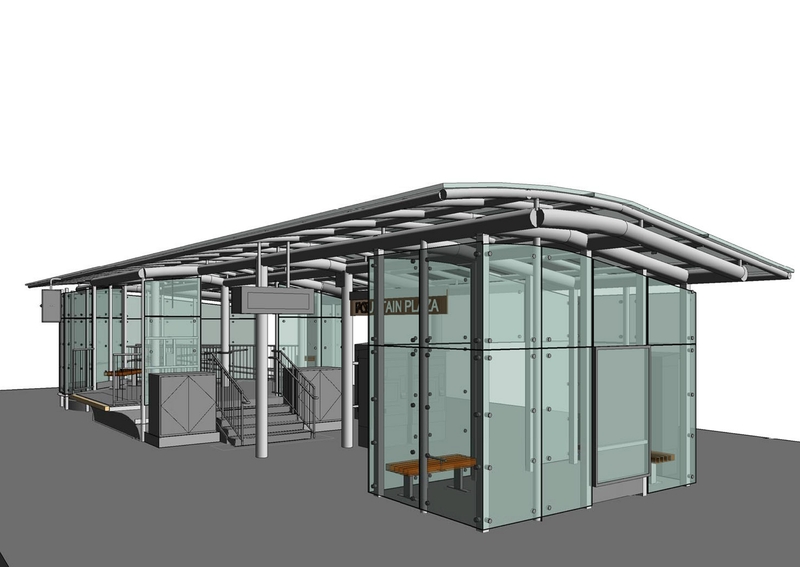 Niagara Frontier Transportation Authority officials unveiled plans for the new station Friday while announcing disruptions in above-ground rail traffic until 1 p.m. Saturday. Crews will dismantle arches that have spanned Main Street near Fountain Plaza Station since the line opened almost 30 years ago. The decorative arches will be removed to upgrade the station as part of the plan to return cars to Main Street, the NFTA said. No trains will operate above ground until 1 p.m. Saturday because of the arch work, requiring passengers to take a shuttle bus service from Allen-Medical Campus Station. It will drop off inbound passengers parallel to Main Street on Pearl Street all the way to Erie Canal Harbor Station. Outbound, a bus will operate from Erie Canal Harbor along Washington Street to Allen-Medical Campus, one block east of the Main Street line. The shuttle will pertain only to the Saturday work, Metro officials said, and delays may occur. They also noted that while Metro trains normally operate on 12-minute schedules, the project to return traffic to Main Street will require use of a single track above ground beginning Sunday and extending into October, prompting 20-minute intervals between trains as opposed to normal 12 minutes. Rail passengers will be required throughout the summer to change trains at Church Street to continue their trip because of the single track, officials said. Special boarding procedures for passengers with disabilities will be required during construction, which will be posted at stations and at nfta.com. More work will confront Metro riders on April 5-6 as the entire above-ground section will be shut down while crews replace aging catenary poles on Main Street. NFTA officials said similar shuttle bus plans will take effect for those days, while additional plans will soon be announced for using as many as 25 buses to help transport Buffalo Bandits fans using Metro Rail to and from the April 5 evening game in First Niagara Center.